TORONTO , Sept. 9, 2018 /CNW/ - RNC Minerals (RNX.TO) ("RNC"), is pleased to announce a new high-grade gold discovery at its Beta Hunt Mine. Over the past week, approximately 9,250 ounces of high grade gold was produced from a 44 m 3 cut (130 tonnes) on 15 level at the Beta Hunt Mine (equal to over 70 ounces/tonne or 2,200 grams/tonne). The high grade gold (coarse gold and large gold-containing specimen stones) includes approximately 190 kg of specimen stone, the largest of which is 95 kg with an estimated gold content of 2,440 ounces and a second large specimen stone of 63kg with an estimated gold content of 1,620 ounces. Final ounces will be determined once the coarse gold is processed and/or sold over the next week which is expected to yield approximately $C15 million in cash. All of the high grade coarse gold is hand picked, direct ship ore and immediately sent from site directly to the Perth Mint. "Recovering 9,250 ounces of high grade coarse gold from a single cut on the 15 level at our Beta Hunt mine, including specimens which could rank among the largest ever discovered, underlines the importance of this discovery. Just 8 weeks earlier, at the end of June 2018 , 1,500 ounces of high grade gold were recovered from other sediment structures on the 14 and 15 levels. 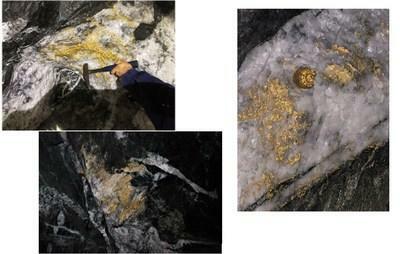 These discoveries highlight the high-grade gold potential of Beta Hunt." said Mark Selby , President and CEO of RNC. RNC is the first owner of the Beta Hunt Mine to focus on drilling deeper in the Lunnon Basalt in its search for gold, and therefore the first owner to discover and mine gold from newly discovered coarse gold located entirely within the Lunnon Basalt. Previous bonanza grade specimen stone occurrences at Beta Hunt were associated with the nickel-sulphide bearing contact between the Lunnon Basalt and the overlying Kambalda Komatiite where nickel mining has been focused by RNC and previous operators. Based on diamond drilling and underground mapping, there are two or more Lunnon sediment bands which are a zone of narrow (< 0.3m ), strongly pyritic black shale horizons positioned approximately 150m stratigraphically below the Lunnon Basalt/Kambalda Komatiite nickel contact (see Figure 2 below). This sediment horizon is well documented in published literature and is recognized as a marker unit in differentiating the Upper and Lower Lunnon Basalt. The sediment horizon is now also interpreted by geologists at the Beta Hunt Mine as a zone of chemical interaction between the gold bearing fluids and pyritic sulfides, which under the right conditions, allow large gold crystal growth and extremely high-grade gold deposition. This interpretation is based on geological mapping and interpretation of structures on 14 and 15 Levels, where 1,500 oz of specimen gold was discovered and mined in the second and third quarter. The structure found last week is located in a dilation zone which contains sheared pyritic sediments, porphyry and Lunnon basalt and large amount of coarse gold and specimen stone. Understanding the depositional model for this new gold mineralization provides potential for future exploration and discovery of high grade gold material at the sediment marker layer, which runs along all known shear structures located at Beta Hunt Mine. Given the significance of this discovery to the exploration potential and value of Beta Hunt, RNC has decided to consider all alternatives, including a sale, to maximize the value of Beta Hunt for RNC shareholders. As a result of the discovery and related developments, RNC is no longer in exclusive discussions with a preferred bidder for Beta Hunt. The strategic process regarding RNC's 100% owned Beta Hunt Mine (announced March 22, 2018 ), is being led by financial advisors PCF Capital Group and Haywood Securities Inc. Please note that although there can be no assurance as to the final result of this process, RNC believes that this direction is in the best interests of the corporation and its shareholders. The disclosure of scientific and technical information contained in this news release has been approved by Kevin Small , Vice-President, Project Development of RNC, a Qualified Person under NI 43-101. RNC will host a call/webcast on Tuesday, September 11 at 10:00 a.m. (Eastern Time) to discuss the discovery. North American callers please dial: 1-888-231-8191, international callers please dial: (+1) 647-427-7450. For the webcast of this event click [here] (replay access information below). RNC is a multi-asset mineral resource company with a portfolio of nickel, cobalt, and gold production and exploration properties. RNC has a 28% interest in a nickel joint venture with Waterton that owns the Dumont Nickel-Cobalt Project located in the Abitibi region of Quebec which contains the second largest nickel reserve and eighth largest cobalt reserve (the largest undeveloped nickel reserve and second largest undeveloped cobalt reserve in the world). RNC has a 100% interest in the producing Beta Hunt gold and nickel mine located in Western Australia and a 35% interest in Orford Mining Corporation, a mineral explorer focused on highly prospective and underexplored areas of Northern Quebec and the Carolina Gold Belt in the United States . RNC also has a 27% stake in the Reed Mine in Manitoba . RNC has a strong management team and Board with over 100 years of mining experience at Inco and Falconbridge . RNC's common shares trade on the TSX under the symbol RNX. RNC shares also trade on the OTCQX market under the symbol RNKLF.